Lately it seems like I'm reading books back to back about life and loss. I believe I'm drawn to those topics especially at this time of year when the vibrancy and liveliness of summer gives way to the unforgiving bleakness of winter. 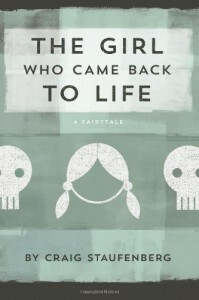 The Girl Who Came Back to Life is about both - how do you keep on living after losing loved ones? Since Sophie lost her parents, she's decided to find a way to the City of the Dead and bring them back with her, thinking everything can go back to the way it was. Sophie's grandmother has taken in her in, but she isn't emotionally available to Sophie. Since Sophie's grandfather died, her grandmother sleepwalks through life. The only times she allows the sharp edges of her personality to fade are when she reads a mysterious letter that seems to give her comfort. I find the idea behind this story oddly comforting, and I say oddly because I like knowing the souls still exist but you don't know what the next plane of existence will be. But you know they're going somewhere. I'm also not sure I could let go. What if you didn't want to Send your loved ones? What if you wanted them to stay with you rather than allowing them to move on to the next stage? Once I heard there are some who believe if you don't "let go" of your loved ones and move on from their death, their spirit will remain here and be prevented from going on to Heaven or wherever you believe your soul goes. That always horrified me because I didn't want to let go of them, but I didn't want to prevent them from going to where they could be at rest. The Girl Who Came Back to Life had me thinking about all of this, and I like to think about it as morbid as that might sound. I was glued to this book - I couldn't wait to find out if and how Sophie would make it to the City of the Dead and what she would ultimately do when/if she arrived there. And her grandmother intrigued me with the way she has emotionally closed herself off. The sacrifices Sophie makes to get to the City touched me. I'd like to think I would have done the same as she did. She's clever and quick thinking. I'm not sure how much I'm like that, or if I'm like that at all. The Girl Who Came Back to Life is an amazing story. The pacing was a bit slow for me at times, but I believe it's a personal preference. I think I was impatient, wanting to find out what was going to happen next so badly. Other than this minor issue, I loved reading Sophie's story.